This is my second version of New Look 6104. This time I opted for the ruffle front and the pleated sleeves. I used all stash items for this. The material is left over from T's Negroni: a cotton pique. And the buttons I already had. I had purchased them to go with a different shirt and they didn't work out for that one, so I was glad to use them here. I messed up the ruffle. I put them on upside down. And one side is slightly longer the other. Whoops. Clearly a perfectionist I am not because I didn't redo it. I did redo part of the hem and part of the neck binding because they ridiculously bad in some areas. I do have standards, low ones, but standards nonetheless. I made the back darts smaller this time to eliminate some fabric pooling in the back. That worked, but as a result there's more overall ease in this version. I'm fine with that because this is a hot weather shirt and I don't like to wear close-fitting things in the heat. Other than that, I didn't make any construction changes. Yet, the bust darts are hitting me lower this time around; I'm not sure why. This is my most common facial expression: what the #%&*? I am happy to announce that the completion of this shirt means I have ticked off several goals. This project belongs to this year's Spring and Summer Palette Challenge and it also fills a gap in my wardrobe. I've been needing a (relatively) basic white short-sleeve shirt and I anticipate getting a lot of use out of this one. Looking back, I realize that I had originally planned to use this fabric with the Simplicity Lisette 2211 pattern, but I'm happy that I went with the New Look pattern instead. I'm still attracted to that Lisette top, but I don't like the sleeves, so when and if I make it, I'm pretty sure I'll use the basic sleeve from the New Look 6104 pattern. So, the round-up on my Spring/Summer Palette Challenge is: 1 down, 2 nearly-down, and 1 cut out. That's a little bit sad seeing how it's nearly August, yikes! Guess I better get crackin'! 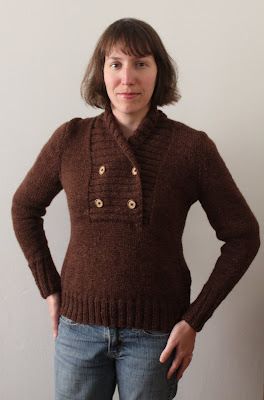 I wasn't convinced about this pattern when I first saw it, but I love this version, especially the buttons! Really cute! It's not too patriotic at all! Oh thats the porfect summer shirt- it looks light but stylish- too adorable. Cute! It´s a perfect shirt for hot weather and you sewed it with leftover fabric, perfect project! It looks perfect to me! I love the buttons you chose, and I love ruffle front blouses - I think they are a perfect combo of feminine and business. Well done!